The trouble with game is that it’s often a case of feast or famine and it’s all to easy to get stuck in a rut with the cookery. The game cookery day is all about turning this tasty wild meat into great dishes. The day begins with an introductory talk, followed by a series of practical preparation and cookery tasks and some demonstrations designed to put game firmly back on the menu in your kitchen. We’re hosting ‘The Complete Game Experience’ bringing you a unique opportunity to spend two full days with two of the South West’s most inspiring Gamesmen, Tim Maddams and Frank Shellard. Tim is a chef, food writer and cookery teacher with a love of the Great British countryside and wild food. He has worked under such culinary luminaries as Fergus Henderson, Marco Pierre White and Mark Hix. Tim has just written and published the River Cottage Game Handbook and whose knowledge of game is second to none. Frank Shellard owns and runs Manor Farm Estate, and is a qualified CPSA instructor. This is a family run shoot in Wellow just south of Bath. Locally known as “Shellards Shoot” it won The Shooting Times best small shoot in 2013. On Day 1, you will be driven to Award winning Shellards Shoot where you will be given a full gun safety briefing by the shooting instructors before enjoying a morning clay-pigeon shooting. After a light lunch you will participate a couple of game drives and have the opportunity to shoot pheasant and other wild game birds. On Day 2, game chef extraordinaire Tim Maddams will show you just how to bring out the best in game, with a series of practical preparation and creative cookery tasks. You’ll be shown a modern approach to game cookery as well as the more traditional style, starting with the whole animal and ending with a delicious three-course meal. The trouble with game is that it’s often a case of feast or famine and it’s all to easy to get stuck in a rut with the cookery. This course will give you the confidence to put game back on the menu in your own kitchen. The Northcote Cookery School is one of the UK’s top culinary schools offering inspirational cookery courses from the heart of Northcote’s Michelin star kitchen.The Northcote Cookery School offers a variety of culinary courses, from skills & techniques; entertaining; themed classes; and premium master culinary classes, with a choice of half days and full days. The courses are delivered by Head Tutor – Michael Vanheste, with master classes available on selected dates from Chef Patron Nigel Haworth, Executive Head Chef Lisa Allen and visiting guest chefs. Autumn provides a veritable larder of delicacies for the experimental home cook. In this masterclass run by Nigel Haworth, supported by Michael Vanheste, we’ll talk you through some of the game that is available on our doorstep and teach you what to look out for when cooking with game. On this busy day course, you’ll learn how to make an exquisite game terrine, get to grips with partridge and make a very comforting and warming pudding to complete the menu. Rachel Green’s real passion is cooking with game. Having been brought up on the family farm in Lincolnshire it was always second nature to cook using the natural ingredients around her. This course goes beyond just fantastic cookery. It is a hands on course showing how you can butcher down the game introducing you to the essential knife skills you need to handle game correctly. Course Time 10.00 a.m. – 4.00 p.m. This course includes refreshments and a lunch prepared by Rachel. Despite the locals’ bemusement at the idea of an Englishman teaching anyone to cook, not least in France, CookinFrance became a huge success taking students from all over the world – including France! 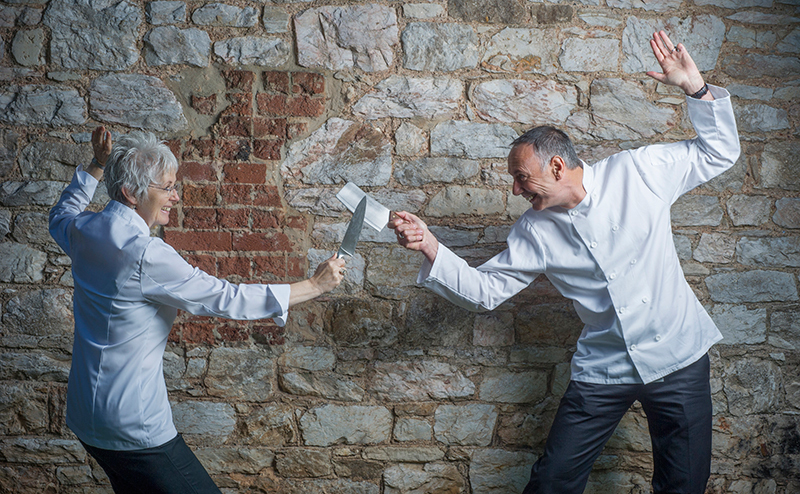 Sixteen years later, Jim and Lucy are back in the UK, offering cooking lessons in Devon – the county of their roots – and raring to go with the successor to CookinFrance: Exeter Cookery School. Jim is a former Masterchef semi-finalist who started his cooking career cheffing in the kitchens of Exeter’s White Hart Hotel (where he and Lucy met and were engaged). He then went on to cook alongside Rick Stein in Padstow, Alistair Little in Notting Hill, and with Tony Tobin of Ready Steady Cook fame. Along with Lucy and former chief wine-buyer for Sainsbury’s, Julia Jenkins, he ran a company cooking dinner parties in client’s homes before moving to France. During his time in France, Jim collected a mass of knowledge and recipes from some of the best chefs in the area and enjoys putting them to use at Exeter Cookery School. He believes that food is good and that cooking should be fun! Philleigh Way is a cookery school based in south Cornwall that also offers unique dining experiences. Bordering the river Fal with the ocean a few miles away this balanced landscape of arable fields, pasture and ancient oak woodland is an inspirational place to learn about food and its provenance. The cookery school is run by brothers-in-law James Martin and chef George Pascoe who belongs to the fifth generation of Pascoes to hail from Court Farm, Philleigh, Cornwall. Their Next Generation Farmhouse Cookery style is inspired by recipes handed down over the generations, fantastic local produce and experience gained working in some of the top kitchens in Cornwall and around the globe. Their creativity, knowledge and enthusiasm make it the perfect place to reconnect with the land and sea, learn some old and new recipes and cook with some of the freshest seasonal ingredients Cornwall has to offer. At Philleigh Way we have reared, shot, stalked, cooked and eaten game in all its various guises for as long as anyone cares to remember. With a commercial shoot run here at Court Farm that tradition is still very much alive. Aside from the commercially reared game such as pheasant and partridge our fields are teaming with an abundance of wild game including Fallow and Roe deer, rabbits, pigeon, woodcock and snipe. Philleigh Way truly is the perfect place to learn about game cookery first hand. Due to the very lean nature of game it can dry out with cooking and the flavours are sometimes more challenging to the modern palate. Your tutor, chef and farmer’s son George Pascoe grew up here at Court Farm and will teach you all of the skills, tips and techniques necessary to avoid these pitfalls. Much of what you’ll learn was acquired by George as a young lad hanging on his granny’s apron strings. 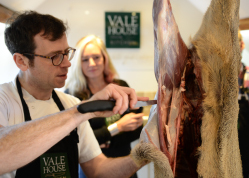 Game Cookery – Hunt out the secrets of truly winning game dishes, with a hands-on day of wild meat at the River Cottage Cookery School. There couldn’t be a better setting for a day of fun and game than River Cottage HQ, with both the rustic Devon countryside and a delicious local lunch to savour. You’ll leave Park Farm brimming with knowledge, and the confidence to source and cook the best seasonal and sustainable game ingredients. Our cookery school in London has been designed by Michel Roux Jr to teach and inspire beginners and accomplished cooks alike. We offer a range of classes, from essential practical skills to master classes with Michel and a host of award winning chefs. Our cooking classes are hands-on, small, fun, friendly and unintimidating. You’ll be taught by hand-picked, talented chefs with a wealth of expertise and experience, who share Michel’s philosophy and passion. Our cooking experiences teach you how to transform top quality, simple ingredients into delicious meals that you can replicate in your own kitchen. Besides our timetabled cooking courses, our welcoming, well-equipped kitchen provides the perfect venue for private groups, corporate entertaining or inspirational team-building events, tailored to your specifications. Discover the distinctive flavours of game and red wine as you prepare and cook two seasonal game dishes followed by dessert. A typical menu might include salad of wood pigeon and hazelnuts followed by roast venison with gnocchi and wild mushrooms. Located four miles from the market town of Driffield and nine miles from historic Beverley, Yorkshire Wolds Cookery School is surrounded by private farmland and the beautiful Wolds countryside. The perfect place to relax, socialise and most of all improve your cookery skills. 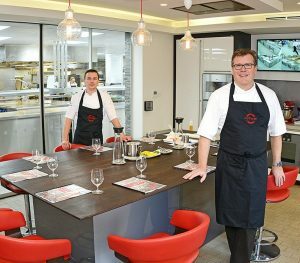 We are also in easy reach of Hull and York and only an hour from Leeds.Yorkshire Wolds Cookery School has been finished to a very high specification with the latest appliances and equipment. There is no need to share on our day classes, we have plenty of blenders for everyone! There are four island cooking stations each with a Falcon Rangemaster induction hob and double oven. One of the stations can be lowered to accommodate people who may prefer to sit. A class designed to take advantage of in season, locally sourced game. Learn more about this underused but wonderful food. Your freezer need never have a pheasant languishing in it again! During the day we will be prepare three different game dishes some of which will be your lunch and the remainder will be yours to take home. 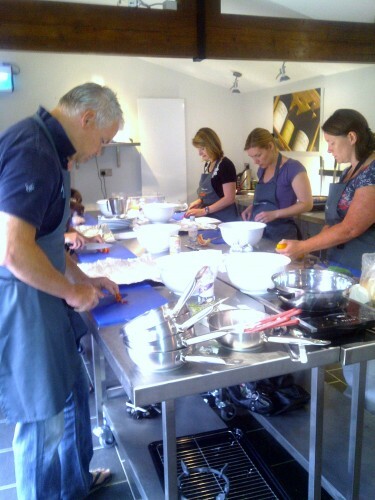 Bridge Sixty Seven Cookery school is located on beautiful Debdale Lane, in Smeeton Westerby, near Kibworth Beauchamp. The Cookery School is approximately 1 mile along the lane, where you will be greeted by the Cows and Sheep as you meander your way down. Bridge 67 Cookery School is the last building on the right hand side at the bottom of the lane. The cookery school is located on a family farm which is informal, relaxed and great fun. You can even have a tour of the farm if you wish. Discover the secrets of how to cook Venison, Partridge, Pheasant, Rabbit, Pigeon and other game. This course is for those wishing to advance their skills or for those already familiar with game meat. During the day, you’ll pick up advanced tips and techniques for the more complex sauces, searing and roasting, stocks, pates, beautiful terrines and melt-in-your-mouth braised stews. Learn how to slow-cook meat with spices for a superb potted venison, or how to layer up terrines with pigeon, venison, pheasant, black pudding, ham hock and cabbage. Discover the delights of a spatchcock partridge for a quick roast or a delicious venison Wellington. This course aims to make game more accessible for the home cook, you will walk away with enough confidence to go home and experiment even more with game. At Edinburgh New Town Cookery School we offer a wide variety of cookery courses, with over 15 courses to choose from across various skill levels you are sure to find a course that suits. On all the practical cookery courses any food that you don’t eat for lunch or that you cook after lunch, you can take home with you to enjoy with your family or friends. Shires Cookery School is based at The Red Lion, East Haddon Northamptonshire. Our classes open up a world of delicious, fresh and healthy food to people of all ages and levels of culinary expertise. Owner James Claydon is also a great chef who will teach you all the skills you need. Not only is James an accomplished chef, in his spare time he has a passion for shooting regularly bringing food from field to fork. James will teach you the journey from feather and fur to amazing meals! A Taste of Game day cookery course is held each year and last year there was a special venison and burger short course. See the website for courses this year.